The All-on-4® treatment concept is a revolutionary concept providing patients with fully functioning teeth on dental implants in a single procedure that is completed in one day. This technology was developed by Nobel Biocare and utilizes collaboration between both the restorative doctor and the oral surgeon or periodontist. You do not need a dental implant for each and every one of your missing teeth. All you need is four- six precisely placed implants on the top of your mouth, and four on the bottom, to restore your full smile. That’s the beauty of the all-on-four. And because the implant is made of titanium, it has the unique ability to fuse to living bone and function as part of it. So eventually, the dental implant becomes part of the jawbone and serves as a strong, long-lasting foundation for your new teeth. After your day at Mullane Dental your new smile will look and feel great, but it’s only temporary. You see, it takes dental implants some time to heal and fuse to your jawbone. Once that happens, you’ll come back in and your team will replace your temporary teeth with a permanent, customized smile designed just for you. The process begins when a dental CT x-ray* is taken of the patient’s jaw bone. This CT x-ray allows for the generation of a three-dimensional model of the jaw bone that can then be used with virtual reality software to plan the implant placement without the presence of the patient. 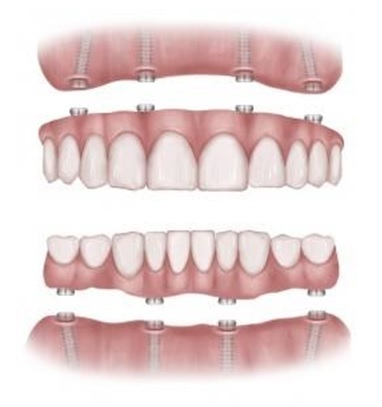 The results are a more accurate implant placement and less chair time for the patient. *Dental CT x-rays use significantly less radiation than a traditional medical grade CT scan.